Oil prices reached a 19-month low after US government figures showed a rise in heating oil and petrol stockpiles. Inventories of refined oil products rose more than expected last week, with distillates up 5.4 million barrels. 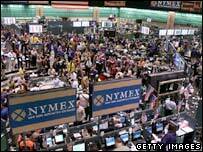 Light sweet crude oil fell $1.62 (£0.83) to $54.02 (£27.83) a barrel in New York. London's Brent crude oil fell $1.49 to $53.69. Warmer US weather has been a major reason for the fall, with lower demand for heating oil among other factors. As well as distillates, figures released Wednesday showed that petrol stocks also rose, adding 3.8 million barrels last week. "Strong builds in products will lessen incentives for US refiners to refine more crude ahead of scheduled maintenance in January and February," said BNP Paribas in a daily report. Despite the fall - which has seen oil lose around a third of its value since July when it peaked at $78.40 a barrel - some analysts stress that the price of oil remains far above its historic price. A barrel of oil was sold for around $41 in 2004 and in 2003 that figure was $30 said Fadel Gheit, an energy analyst with Oppenheimer & Co. The decline in oil prices has been echoed in other commodities including metals. The market will be closely watching to see what stance oil cartel Opec decides to take in coming weeks, if prices continue their downward trend. The group agreed in December to reduce output by some 500,000 barrels a day starting 1 February.